Families and interested citizens needed for turtle-centric beach hike. During the warm nesting season, park rangers conserve habitat, eliminate trash, and patrol the beaches for critters. We want you to help our endangered sea turtles and join us for this short beach hike with lots of sea turtle information and hands-on activities for the whole family! 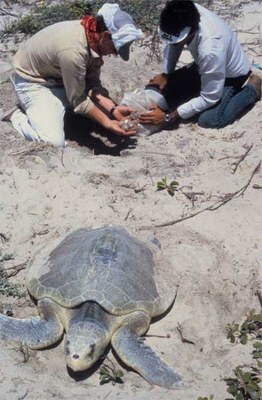 You can become a citizen scientist, and help the park to understand more about the Kemp's Ridley Sea Turtle, an endangered species that nests Galveston Island State Park. We will take a stroll down the beach and explore ways to help the environment. NOTE: sea turtles may not be present on the beach when you're here, but need human help for survival. We will meet at the day use beach area and begin a short hike, patrolling for turtles on this easy, beach hike. Families, groups, and pets on a leash are welcome. • Great family fun for all ages.